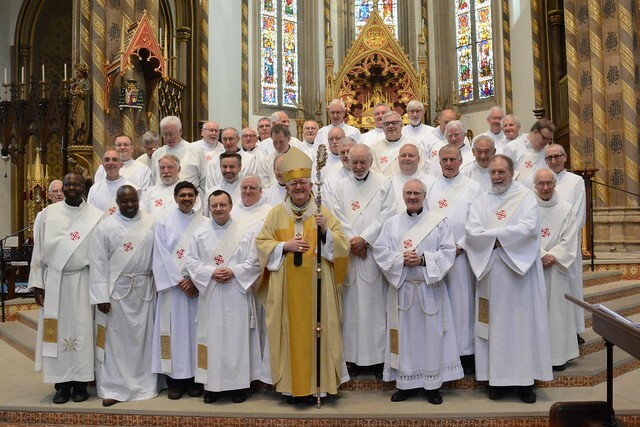 A celebratory Mass of Renewal for Deacons has taken place at St Chad’s Cathedral. Deacons from across the Archdiocese gathered on Saturday 9 June for the annual event, which was led by The Most Reverend Bernard Longley, Archbishop of Birmingham. This special Mass brings together all the Permanent Deacons, their wives and families, to celebrate their ministry and renew the promises of faithful service they made at ordination. As part of the service Archbishop Longley led the Rite of Institution of Readers, Rite of Institution of Acolytes and Renewal of Commitment to Diaconal Service - inviting the deacons to renew their own dedication. At this mass Paul Bradley and Lionel Pelloquin were given the ministry of readers, and together with Robert Breedon all three the ministry of acolyte. There are now more than 80 permanent deacons in situ across the Archdiocese, all playing a vital role within the Archdiocese family and the communities they serve. Following the ceremony a celebratory lunch was held for all deacons and their families.